Republican Brad Raffensperger won in the runoff election for Georgia secretary of state on Nov. 4, defeating Democratic nominee John Barrow. Raffensperger received 51.97 percent of the vote and Barrow received 48.03 percent by press time, according to the Georgia Secretary of State website. The runoff race for secretary of state was triggered after both Barrow and Raffensperger failed to secure more than 50 percent of the votes in the Nov. 6 election. Raffensperger pledged to “strengthen voter ID,” increase the security of voting machines and “keep our voter lists and updated,” similar to his predecessor Brian Kemp, who relinquished his title of secretary of state after he became Georgia governor-elect. Several Emory student organizations, including Planned Parenthood Generation Action at Emory, Emory Climate Analysis and Solutions Team, Asian American Pacific Islander Student Activists at Emory, Planned Parenthood Generation Action at Emory, Emory Student Government Association, Emory Campus Life and Emory Sustainability, promoted a Facebook event that provided students with directions to polling locations using Emory’s regularly scheduled Cliff shuttles. 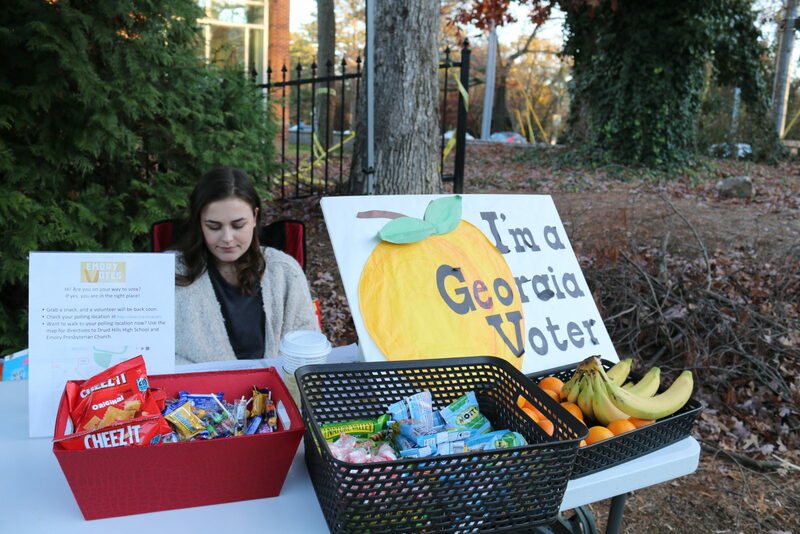 Student group Young Democrats of Emory set up tables at the Emory Farmers Market on Tuesday to encourage students to vote in the runoff. Young Democrats First Year Representative Benjamin Rosenn (22C) said creating awareness about the election was the main priority. Angela Jiang (19C), president of the Emory Climate Analysis and Solutions Team, also stressed the importance of voting in the runoff. Jiang emphasized the particular importance of the runoff election for Georgia Public Service Commissioner in District 3, because of the regulatory power held by the Public Service Commission over electric, natural gas and telecommunications companies. “Public Service Commissioner has everything to do with climate change,” Jiang said. “The role is to be the major government regulator that regulates utilities.” He added that it was important for there to be proper regulation of utility companies in the state in terms of emissions and other climate-change related topics.